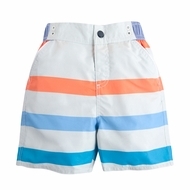 Help your son stay cool this summer with a brand new pair of swim trunks from your favorite children's clothing brands. 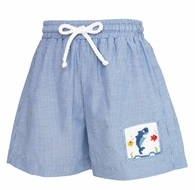 BestDressedChild.com is your source for the latest styles and trends in baby boy swimsuits. 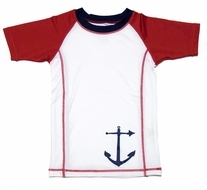 Your son will look great while he builds sandcastles, splashes in the waves and enjoys everything the summer has to offer. We carry swimsuits by all of your favorite brand-name designers such as Florence Eiseman, Snapping Turtle, Anavini Baby and more. These designers are well-known for creating fashion-forward children's clothing. Your son will be the envy of every little boy on the beach when he steps out in his new swimsuit. In addition to infant boy swimwear, we also offer a selection of accessories including cover ups and sun hats. These accessories help protect your son from UV rays when he's not splashing in the water. They also make it easy to transition from water sports to other activities without needing to change. Shop our incredible selection of baby boy bathing suits to discover the latest brands and fashions for your son. You're sure to love our huge variety of high-quality clothing and everyday low prices.